The Colorado Senate narrowly passed the extreme risk protection order bill on Thursday. The Colorado Senate narrowly passed a contentious gun control bill on Thursday that would allow police to temporarily take away someone's firearms. The extreme risk protection order proposal would give law enforcement the ability to take the weapons away if a judge determines their owner poses a risk to themselves or others. 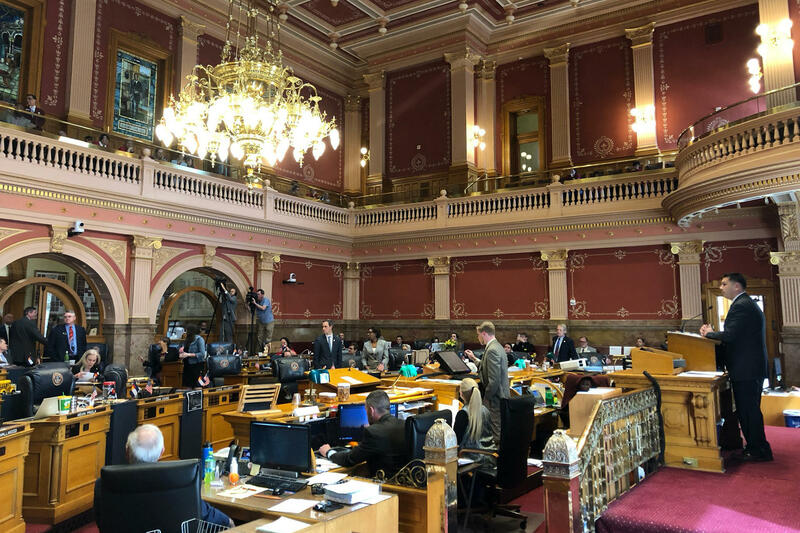 After Thursday's 18-17 vote, the bill is heading back to the House for consideration of amendments added by the Senate. Gov. Jared Polis supports the legislation. But Democratic Senate President Leroy Garcia broke with members of his party and voted against it. Garcia didn't speak about his opposition to the bill during the debate on Thursday. He told the Pueblo Chieftain, his hometown newspaper, earlier this week that he didn't think it was "the right legislation for the people of Pueblo and southern Colorado." All the Republican lawmakers in the legislature also opposed the measure, saying it would violate people's constitutional right to bear arms. They worry police could get injured while trying to take away someone's weapon. "This bill turns liberty on its head," Senate Minority Leader Chris Holbert said early in the final senate debate. Democrats who support the bill said it will save lives and prevent deadly gun violence. "What is wrong with empowering a family member who sees someone who is out of control and they need some help and they call the police?" Sen. Rhonda Fields said. "That is what the police are there for: to intervene." Several supporters of the bill watched from the gallery above the Senate floor. They wore red shirts and shared photos of gun violence victims and survivors on social media. Moments before the bill passed, Democratic Sen. Lois Court said the bill's opponents were making false claims about the measure. "Good lord, the dystopia I have heard discussed here today," she said. "Stalin. Nazi Germany. Communist Cuba. We are not talking about anything close to that. We are talking about a judicial process. We are talking about being able to go to a judge and ask that someone who is danger of hurting themselves or others have their guns temporarily removed." She said the bill has been amended 25 times this year. "This is absolutely about valuing life over property," Court said. El Paso County Commissioners voted unanimously Tuesday in favor becoming a Second Amendment Preservation County. It’s just the latest of several other counties across the state speaking out against a so-called red flag bill currently in the legislature. The state measure would allow law enforcement to remove firearms from citizens deemed to be a danger to self or others.